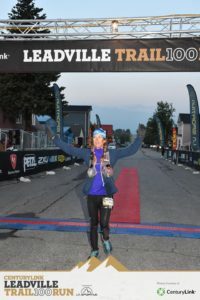 Around 2:30 am on the third Saturday of every August, there’s a moment when I feel tempted to crawl back into bed instead of lacing up my shoes to run another Leadville 100. A little voice in my head whispers that I’m getting too old for this kind of silly adventure, that choosing to endure so much pain defies logic and reason, that there are more sensible and less self-destructive ways to add another piece of belt jewelry to my collection. A girl can never have too many buckles. Those pointy batman ears go up to 12 600 feet. 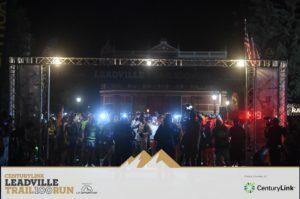 The finishing rate at Leadville is between 35 and 50 percent. Every time I start, I wonder: will I finish this race, or will it finish me? But every year, these worries melt into a surge of pure excitement during the final countdown, when 700 GPS watches beep as one, 700 head lamps beam into the darkness, and the shotgun blast at 4 am sharp sends all of us silver buckle dreamers down 6th street at a pace way too fast for what we’re trying to accomplish. With enough luck and grit, we hope to make it back here sometime Sunday morning. 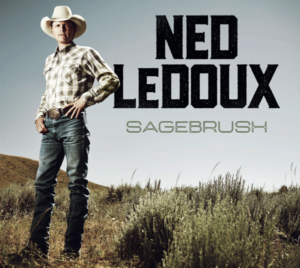 And we’re off to chase a silver buckle. 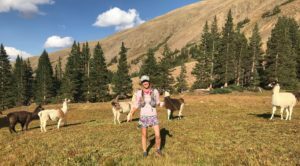 This year, Leadville feels even more daunting than usual because I am doing the Grand Slam of ultra running, meaning I tackle the four original 100-mile races in one summer. 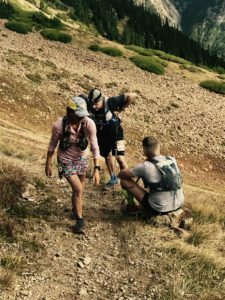 Leadville is my third 100-mile run in 56 days, with Wasatch following just 19 days after. I can still feel the lingering effects of Western States and Vermont in my quads. For the first time, the big sub-25 hour buckle is not my goal, but a sub-27 should be doable. He finished in under 25 hours. And he completed the Leadman series. Dave Mackey is as tough as they come. The wave of excitement fades into quiet determination as I settle into a steady rhythm down the long dirt road affectionately known as the Boulevard and then the rolling single track around Turquoise Lake as daylight inches up on the horizon. I keep my easy but consistent pace on the climb up Hagerman road and down the power lines. Dave Mackey runs right in front of me, looking strong, which makes all of us with two legs feel like slackers. This image stays with me the rest of the race, a powerful motivation. Outward Bound, mile 25. The rain hasn’t started yet, but it soon will. 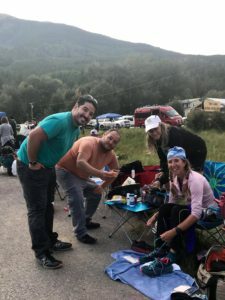 My crew, i.e my amazing ultra husband David, plus Tammy, Bobby, and Chris wait for me at Outward Bound with sunscreen and cold ginger ale. I’m well behind the overly optimistic sub-26 hour splits David has written into my pace chart, but unlike last year I continue at my sustainable pace instead of trying to make up lost time. 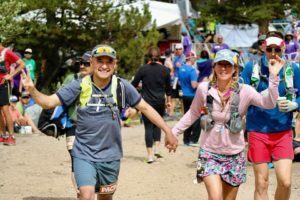 My goal is to not just finish Leadville, but to finish Wasatch. “19 days!” becomes my mantra, a useful reminder to run smart. The predicted rain starts right after Outward Bound and continues on the rolling descent toward Twin Lakes. My favorite section of this course feels different this year, but no less beautiful: glistening aspen leaves, the smell of wet earth. My rain shell does not hold up to the promise on its label; I’m soon soaked to the skin, but it’s ok as long as I keep moving. Lots of positive energy at Twin Lakes. The rain stops right before Twin Lakes, where my enthusiastic crew makes sure I’m ready for the first climb up Hope Pass. Because of the cooler weather, I actually feel hungry, my shivering body crying for calories. I have learned from my epic Western States bonk that I should listen to it, so I munch on potato chips and tortilla pieces with a little cheese. I will need the energy for the mountain just ahead. Twin Lakes is the calm before the storm. 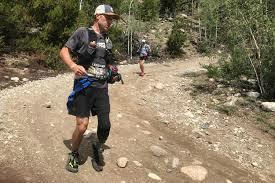 From here, the trail leads through the Arkansas river and then straight up Hope Pass, the crucible of this race. Because I have not done any altitude training, I feel apprehensive about the steep climb ahead. One foot in front of the other, keep breathing. 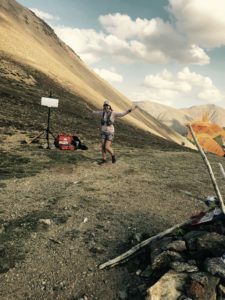 Near the treeline, lead runner Rob Krar comes flying down, a blur of beard and speed on his way to almost breaking the course record. Llamas and watermelon at Hopeless. What more does a runner need to be happy? Near the bottom, the lead woman passes me on her way back up. Two minutes behind her, a familiar face: fellow New Mexican Katie Arnold, in hot pursuit and, as I find out later, on her way to a spectacular sub-20 hour first place. Go Katie! David, getting ready to pace me over Hope Pass: one of our most romantic dates in 25 years of marriage. Thank you, sweetie! My only real low point comes right before Winfield, on the pretty stretch of rolling single track that adds almost two miles to the course, which feels unnecessary and mean. I reach Winfield in a crabby mood, cursing the race director and any of the other sadists responsible for the bonus mileage. But once I cross the bridge into Winfield, I shake off the irritation and feel lucky to be here, to see my crew, to have made it to the half way point. As a bonus surprise, David is ready to pace me back over Hope pass. We joke that this is the most romantic date we’ve had in months as we head on out and up. It’s a grueling climb, but we get there eventually. David, on fresh legs, keeps dashing ahead to take pictures, which makes me feel like a superstar. A parade of familiar faces comes toward us on their way into Winfield: Jared, John, Shana, Eric, Zach, Laura, Francisco, Toby. Words of support and encouragement pass back and forth. I realize how at home I’ve come to feel in this crowd since 2012, when I toed the line for the first time. 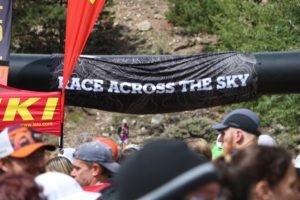 I remember sitting at the the pre-race briefing that year, listening to Ken Chlouber and Merilee Maupin calling the entire audience their Leadville family. 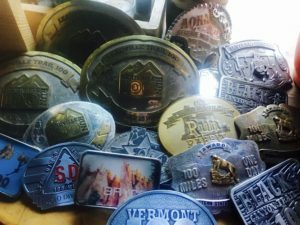 I remember rolling my eyes and, thinking, cynic that I am, “yeah right!” In 2018, on my way to earn buckle #6, that pre-race speech sounds like an honest truth. Coming to Leadville feels like a family reunion, one I look forward to every summer. Mile 60, almost back at Twin Lakes. We reach Twin Lakes at sunset. Ultrahusband David, who has been injured and not running much for the last few months, looks exhausted, so I reassure him and the rest of the gang that I don’t need a pacer for the last 40 miles while they help me change into warm layers, doctor my blisters, and hand me my lights. It takes a village: I could not have done it without my super crew. Darkness falls on my favorite section through the aspens. 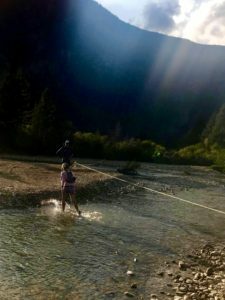 Last year, I ran a bunch of sub-10 minute miles form Twin Lakes to Outward Bound, then blew up at mile 80 and lost my vision at mile 90. I staggered across the finish line wrecked and nearly blind, which was not fun. This year, I run smarter. The night air is cold enough to see my breath. 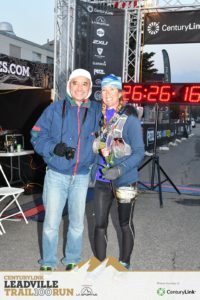 I add another jacket to my bag lady outfit at Outward bound, but don’t spend much time at the aid station. It’s way too tempting to sit down near the heater, which is not what I need to do if I want to finish. More rain starts falling on my Powerlines climb at mile 80 – a cold, driving rain in near freezing temperatures. It’s after midnight. I know there are five false summits before the real one, so I do what any sensible ultra runner would do: I put on some music, put my head down, and keep climbing, cold and soaked to the skin, but strangely happy, with rodeo songs in my ears and the image of Dave Mackey etched into my brain. Other than that, I am alone. 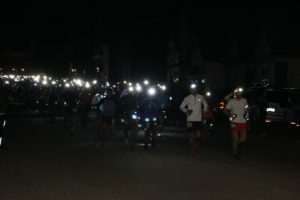 The runners chasing the big sub-25 hour buckle are past May Queen by now, those who just want to finish still on their way to Outward Bound. In between, it’s down to the mountain, the rain, and me, with the power lines humming above. In the damp, dark middle of the night, I realize with a jolt of gratitude how lucky I am to be doing what I’m doing. I turn off my lights and stop for a few seconds, looking up at the jagged clouds and soaking up the magic of this moment, until the cold gets me moving again. At the summit – the real one, finally – friendly ghosts of Space Camp offer standard and not-so-standard aid station fare, including “pretzels, potato chips, ginger ale, CBD, THC.”I’m tempted to experiment with Colorado-style pain relief, but the rational part of my brain still functions enough to stop me in time. May Queen. My Garmin has died. My quads hurt. I have no idea what time it is, and I don’t care. It’s dark. It’s cold. I have 12.5 miles to go. The hard climbs are over. The rain has stopped. This is the last time I see Tammy and David before the finish line. One last group hug. One last change of batteries. One last cup of Ramen noodles, one last handful of potato chips. I’m scraping up my last reserves of energy, determined to finish. Nothing feels as good as crossing the finish line of a 100 mile race. Nothing. The single track around the lake has become longer since yesterday morning, I swear it. The last steep, short downhill, the railroad tracks, then finally the Boulevard, which seems to go on forever. I keep moving at a powerhike, try to break into a shuffle here and there, but can’t keep it up for long. The sky lightens to grey, then pink. I feel pain all over – in my hamstrings, my quads, my calf muscles, my feet. Even my arms and shoulders hurt from wearing my pack for so long. Even my throat hurts, from breathing so hard in thin, cold air for so long. I know I have chafe marks in unmentionable places, plus blisters between a few toes. But underneath all the agony, joy has settled even deeper into my bones. I will get there. 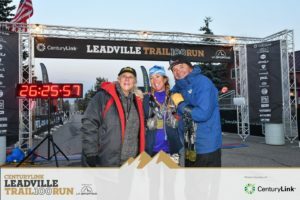 I will finish Leadville for the 6th time. I am alive. I am upright. I am still moving. I have made it through the rainy, chilly night. I have made it across the mountain and back. The promise of a sunrise peeks over the horizon. I know, in my heart and every cell of my depleted body, that all will be well with life, with the future, with the world. In a nutshell, this feeling is why I love running 100s. Ken and Merilee, doing what they do best. Thank you! Finally, pavement, which means the finish line is less than a mile away. A volunteer directs runners to the left. I turn right. He yells “No, THIS left!” My brain seems to have turned into mush, but I’m almost home. 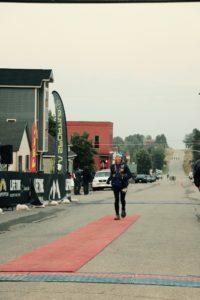 I run (well, ok, I shuffle) from the top of 6th street all the way to the red carpet, into the waiting arms of race co-founder Merilee Maupin. “Welcome home!” are the two sweetest words I’ve ever heard. More hugs – David. Tammy. Chris. Bobby. Ken Chlouber. My family. My people. I’m home. I feel so happy I start crying. Husband, pacer, crew chief, cheerleader, photographer – David Silva, just an all around good kind of a guy. 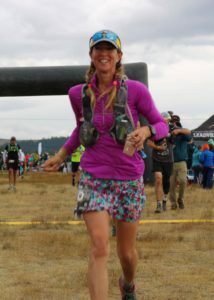 2018 was not my fastest, Leadville 100 by a long shot, but I feel human at the finish line, which I have crossed as 10th place female, in a respectable time of 26:24. The next day, I am able to climb up the podium to accept my second in age group award, behind race winner Katie (over 6 hours ahead of me!). Now, it’s time to get ready for Wasatch. I have no idea how I will run another tough 100 19 days after finishing Leadville, but there’s only one way to find out. Thank you, Ken and Merilee and everyone involved in race organization for putting on such an epic event (in spite of the two extra miles). Thank you, everyone who volunteered, cheered, and high fived along the way – you made a difference! Thank you, Tammy, Bobby, and Chris for giving up your weekend to lose sleep, hang out in the rain and cold for hours and hours, change dirty socks, and perform the other glamorous duties of a good crew member. I will owe you three for the rest of my life. And, as always, thank you, David, for being the amazing crew captain/photographer/pacer/cheerleader/husband combo model that you are. 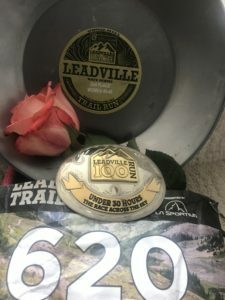 I am the luckiest woman alive.
. . . and last but not least a special shoutout to Ned LeDoux for the song that sums up what the Leadville 100 is all about. I remember him playing the drums at his dad’s concerts many years ago, but had no idea he could sing. Looking forward to the next album already! This entry was posted in Uncategorized on September 5, 2018 by silvakat. Thank you for sharing your story. I love the insight into different areas of this race. I hope to see you there, next year! 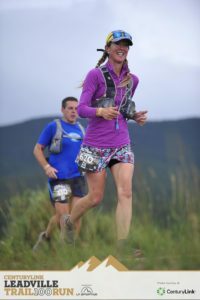 Lisa, you will run Leadville next year, and you will cross that finish line under the 30 hour cutoff. I know you will be ready. I look forward to helping you get there.